Ryan produces one of these after every game we play. He wasn’t happy about this one. “Show me a good loser, and I’ll show you a loser,” said Vince Lombardi, famously. We don’t necessarily subscribe to that philosophy in our household, but both Veronica and I believe it is important to teach our kids to win and lose. We never believed in playing games until everyone won. We preferred to allow a winner to be declared, and to teach our kids that winning is no big deal, nor is losing. Didn’t win this game of Uno? No problem. Maybe you’ll win the next one. This is a particularly important concept for Ryan, because he keeps track of the score in everything. Not only score, but statistical minutia as well. At the start of the NHL playoffs in late April, Ryan declared that we were going to begin a new street hockey series. The rules of the game were established long ago. We take turns shooting. 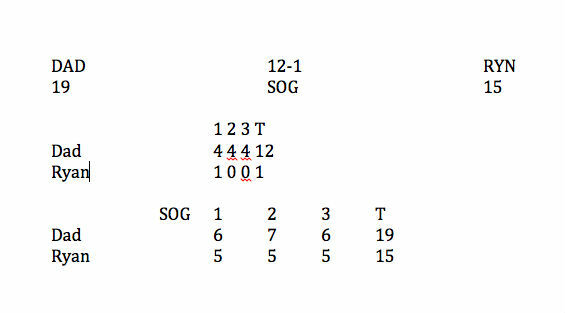 Five shots each equals one period, three periods to a game, sudden death (one shot a side until a winner is determined) if the game is tied. We play on our back patio, where we keep the sticks, net, and street-hockey balls at the ready. Ryan says the series was going to continue until the playoffs end. We’re up to 23 games now, and Ryan holds a slight lead at 13 games to 10. (Want to know the overall shots on goal, save percentages, and goals against averages? Ryan has those, too). We try to play one game every single day. We’ve played in sunshine, rain, twilight, wind, you name it. We’ve played through injuries — about 30 minutes after Ryan crashed his bike and skinned his knee pretty badly, I patched him up and we were back out there. I try to manage the outcome of these games to teach Ryan about winning and losing. He wins some games because he’s better than me, others because I don’t take them seriously or maybe don’t try my best in goal, allowing him a dramatic comeback. While I can’t always dictate the outcome, if I put my mind to it, I can usually beat him. I try not to allow any streak, winning or losing, to reach more than a few games. Last week, Ryan’s lead in the series grew to four or five games, and he was starting to tell me after each game how much better he was, how I was a terrible goalie, etc. In other words, he was getting cocky. Time for a social experiment, and a lesson in winning and losing. The next game, I tried my hardest. I held nothing back. The final score was 12-1. His frustration grew throughout. He cursed. He yelled. He slammed his stick. He ran off as soon as it ended (to type of the statistics, naturally, but he was really angry as he did so). When I got to him, we talked about it. I wanted to know why he was so upset. He said the outcome was “unfair” because there was nothing he could do to score on me. I reminded him that losing by one goal or losing by 11 goals still only counted for one game in the series. I pointed out that he was still leading. I also told him that losing was part of playing, and that if he was going to react that way, I was going to call off the series and declare victory by forfeit. He apologized for cursing and stick-slamming and promised to try harder to control his emotions in the next game. Was it the right thing to do? I don’t know. I don’t believe in allowing my kids — either of my kids — to always win. I think competing, keeping score, and declaring winners and losers is healthy. In Ryan’s case, I have no choice. Even if I don’t keep score, he does (and he records the results on his computer). There’s no talking him out of it. Competition is part of life, and most of the time, someone is keeping score. I don’t believe it’s healthy, wise, or realistic to avoid it. I also don’t believe in over-emphasizing the result. You win some, you lose some. The important thing is to have fun, try your best, handle the result with dignity and class, and play again the next day. Don’t let any one result define you. Back to our endless series, I think that one game has had a positive effect on Ryan. He continues to lead the series, but he handled his last few losses with no issues. He congratulates me, shakes my hand, and asks if he played well. It’s not enough for Ryan to keep track of the final score. He needs to be able to assign a reason for why each of us won or lost. It’s a habit he’s honed by watching hundreds of NHL games on TV over the years. He thinks, and talks, like television analyst. Ryan has done one more thing in his losses of late: He always points out to me how he was in control of his emotions. He’ll tell me the loss was really upsetting but that he kept everything on the inside. This is an important life skill. Nobody is ever going to play with him at recess (at least not more than once) if he flies off the handle any time he loses. Our series we’ll continue. It’s rainy in New Jersey today but as long as there’s no thunder and lightning, we’ll be out there tonight playing — and keeping score. Nicely written. What about more pictures from the festivities this weekend? I have a few more on my phone that I will send you when I have a chance. That story should be submitted to every little league, softball, YMCA, Youth Soccer, etc… Great lessons for kids, parents and Coaches. It is just as important to learn how to win as it is to learn how to lose. By teaching both, you de-emphasize the importance of both. But there’s no sense in ignoring the idea that people like to win more than they like to lose. It should just never be the end-all-be-all of youth sports. That’s awesome – and a lot of kids don’t get taught how not to be a sore loser properly. He’s on a great road right now toward having true sportsmanship. One of the reasons I love hockey so much is that despite all the heinous acts that players commit on one another at the NHL level, there are obvious displays of sportsmanship. Players will congratulate each other after a fight, and the post-series handshake still gives me goosebumps every time.